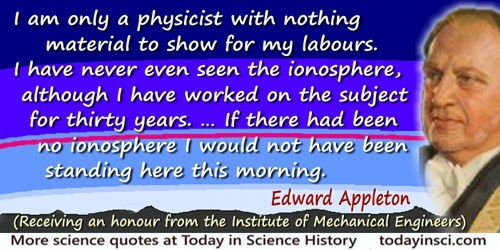 I am only a physicist with nothing material to show for my labours. I have never even seen the ionosphere, although I have worked on the subject for thirty years. That does show how lucky people can be. If there had been no ionosphere I would not have been standing here this morning. Response to receiving an honour from the Institute of Mechanical Engineers. As quoted in New Scientist (22 Nov 1956), 33.